If you have just opened a new company, regular meetings are essential to take your business on the road to success. A meeting is an important event in an organization because the whole team usually gather around to discuss things or issues that are relevant to the overall well-being of the organization. It is the perfect time for all the people involved in the organization to brainstorm helpful ideas and find solutions to address the problems. To ensure an effective and productive meeting, the use of an effective agenda is commonly required. Whenever you desire to achieve something, you will need to use a couple of tools to make the process of attaining something a lot easier. In this case, the perfect tool to use to achieve a productive and successful meeting is an effective and well thought-out agenda. 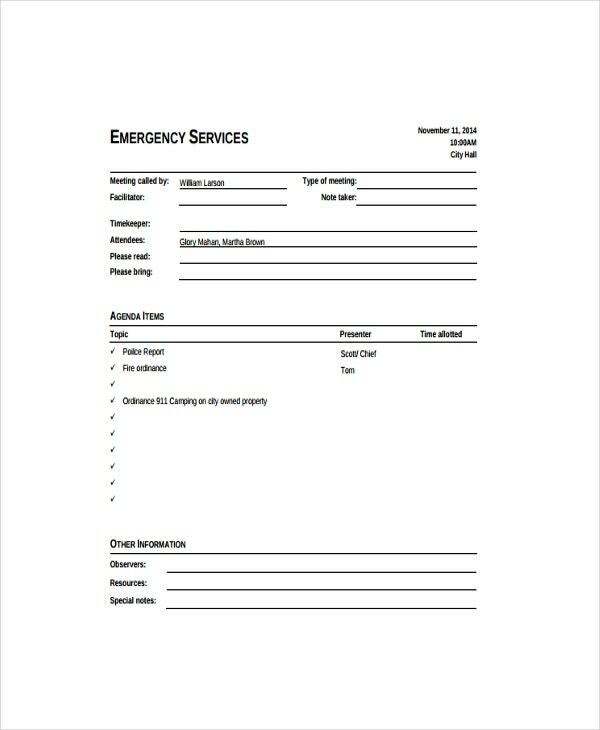 While a lot of people are familiar with this type of business document, there are still many people who wondered what is an agenda. 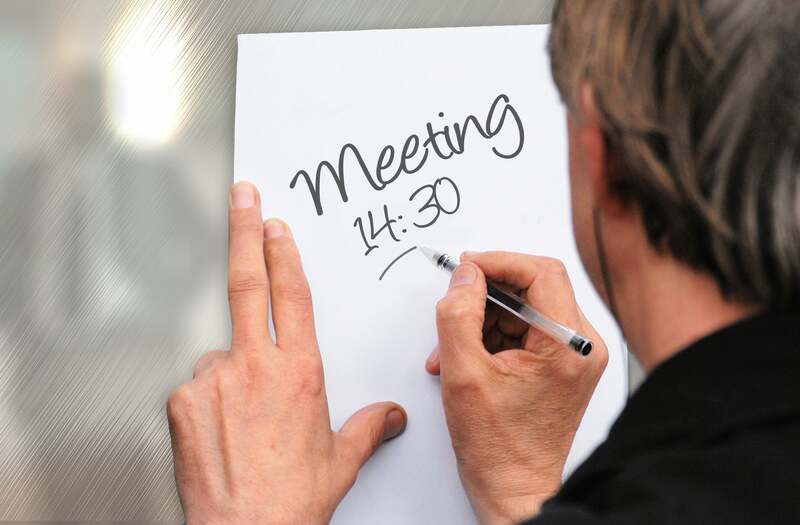 As a business entrepreneur, you should also be familiar with the tips on how to create a meeting agenda. You should keep in mind that your ability to write an effective agenda is beneficial for achieving a successful meeting. No matter how great the items you are looking to discuss at your meeting, a meeting agenda can only work effectively if used properly. 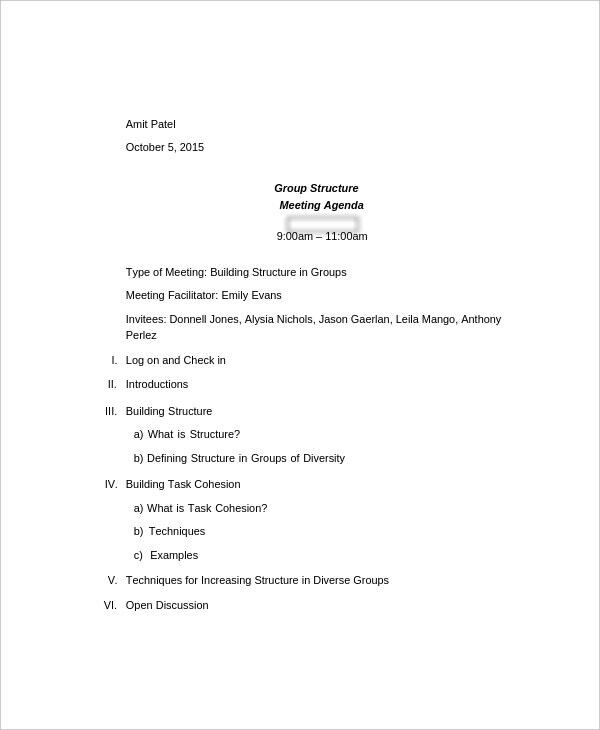 When an agenda is used correctly, it will help the meeting attendees or participants function as one team. In this section, we will provide you a short list of reasons why it is important to use a meeting agenda. Preparation and Planning – To ensure that your meeting is on the right track, proper preparation and planning is essential in developing an agenda. 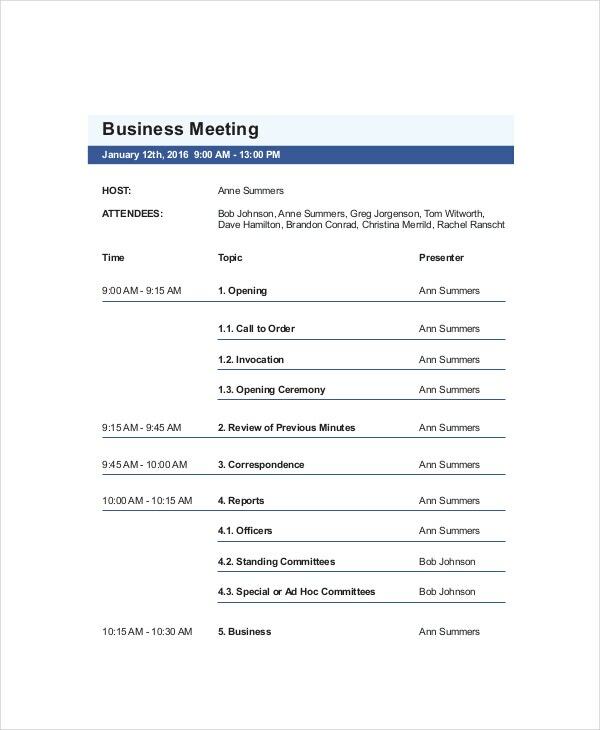 Preparing and planning the whole meeting agenda can be a bit overwhelming for some, that is why an initial meeting agenda is sent out to the attendees so that they can provide more insights and updates on the agenda. To make things easier for you, do not hesitate to browse through our collection of strategy meeting agenda templates. Determines Objectives and Goals – As the organizer of the meeting, it is highly important that you know why you are setting a meeting in the first place. Using an agenda helps you identify your objectives and list down the set of goals you want to achieve at the end of the meeting. Being able to determine the objectives and goals of your meeting can influence in making an informed decision. Productivity – Once you are able to identify your objectives, you are able to stay on track in addressing the issues you and the whole team want to address at the meeting. Being able to understand the items that are to be discussed, it will be easier for the organization to cover everything and ensure productivity. Additionally, you and the attendee can end the meeting with a feeling of accomplishment and productiveness. Communication – The use of an effective agenda is crucial for communication purposes. Use it as an opportunity to inform the whole team about the current issues faced by the organization, goals, and new tasks and responsibilities. It is a powerful tool that is used to keep professionals belonging to different departments to work harmoniously with the development and progression of the organization’s plans. 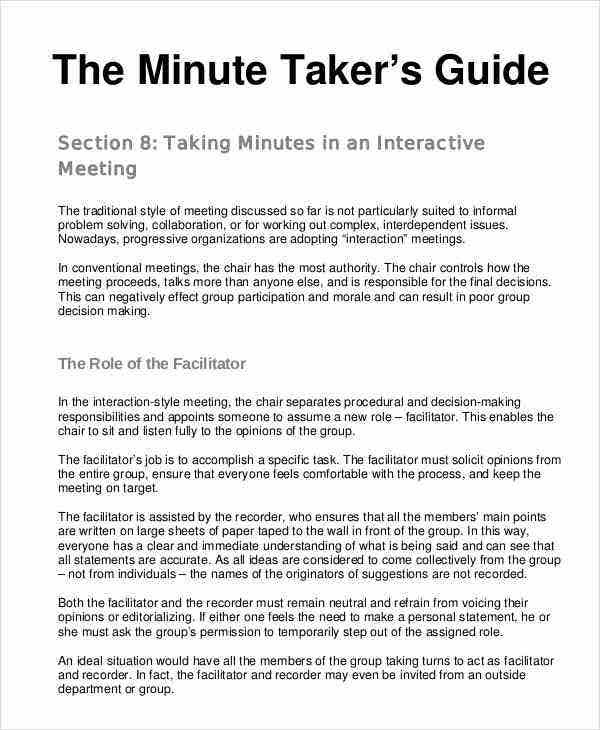 Although there are a lot of meeting agendas that can be found and downloaded from the Internet, using one may not work for especially if you choose the wrong type of agenda for your meeting. No matter how efficient and straightforward your meeting agenda is, if it does not fit the purpose of your meeting, then all your efforts will be wasted. A meeting agenda comes in four different formats, and each of them has a specific purpose. If you need to familiarize yourself with them, make sure to browse and download the agenda format templates. They are free and are effective references to guide you when writing your own meeting agenda. 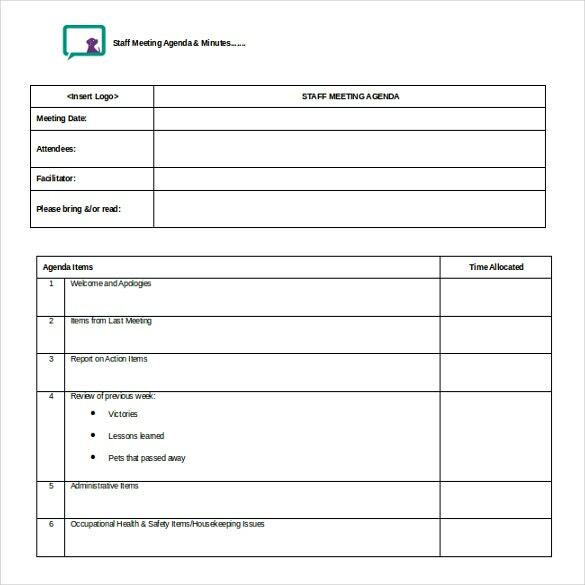 In this section, we aim to help you familiarize the different agenda format so that you will be able to choose the appropriate type for your meeting needs. Meeting organizers and attendees are able to work and achieve their set of goals through the use of an effective meeting agenda. If you find the task of writing an meeting agenda challenging, do not hesitate to ask opinions or help from your colleagues. Their inputs are not only crucial for identifying the meeting objectives but also in finding sensible solutions to address the problems and issues. Before you leave, feel free to browse through our simple agenda templates that are perfect for small startup businesses.